Warm olive oil over medium heat, sauté onions and leeks for about 2 minutes or until translucent, without browning. Add vegetable stock and potatoes. Simmer until potatoes are tender, about 10 minutes. Add chopped asparagus and continue to cook until asparagus is tender, about 7 minutes. Adjust seasonings at this point. Use an immersion blender to purée until smooth or transfer soup to a blender in small batches. In a separate bowl, gently mix together parsley, garlic and lemon zest. 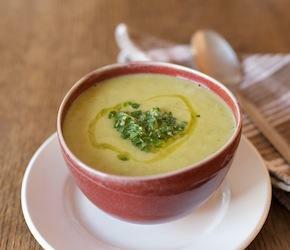 Garnish each bowl of soup with a tablespoon of the mixture.